Here you will find answers to the most commonly-asked theme questions, as well as tips and tutorials for making the most of your blog. If you can’t find what you’re looking for please get in touch; you can tweet us, email us, or message us on tumblr. Copy the code from the theme's download page. Navigate to your blog's customize page - located here on your primary blog, and at https://www.tumblr.com/customize/username on any secondary blogs. Click the 'Edit HTML' button. Clear all the code in the 'Edit HTML' panel and paste in the new code. Click 'Update Preview' and then 'Save'. Refresh the page to see updated appearance options. Each PÊB theme comes with buckets of appearance options. You can change these options on your customize page - located here on your primary blog, and at tumblr.com/customize/username on any secondary blogs. Please note that the blog preview in the customize page may not be an accurate representation of how the theme looks on your blog, this is because tumblr doesn't fully reload the preview when you change appearance options. It is often better to save every the options and see how they look on your actual blog. Please note this feature is for advanced users who are comfortable with CSS, if you're unsure it's better to stick to the font options Tumblr provides. 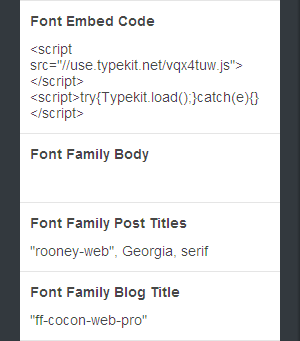 You can put any html in the 'Font Embed Code' option, usually fonts are installed as script or link tags. Then enter the css values of the fonts in the Font Family fields, each filled field will override its corresponding font option. You can also provide fallback fonts for browsers that don't support @font-face in each Font Family field. To use your own custom fonts it's advised to upload them to Tumblr's static asset uploader and link to them from there. As it's impossible to upload assets to your blog's tumblr subdomain, to avoid CORS problems you should Base64 encode your font using a service like Font Squirrel's webfont generator. Navigate to your blog's customize page - located here on your primary blog, and at tumblr.com/customize/username on any secondary blogs. Scroll to the bottom of the appearance options and click 'Add a page'. Change the layout to 'Redirect', note this option will only be available if you've confirmed your tumblr account through email. Give the page a nice url, for example 'pebthemes.tumblr.com/twitter' can redirect to 'twitter.com/pebthemes'. This is for showing a link in your blog's header or sidebar to a post tag, useful for portfolios or highlighting featured content. Give the page an url, which can be different from the tag name, and have it redirect to '/tagged/tagname'. If you want posts to show chronologically you can redirect it to '/tagged/tagname/chrono'. Click 'Show a link to this page' and give it a display name. Click on the 'Tracking Info' of your property. Copy the Tracking ID (should look something like 'UA-22794950-1'). Paste it into the 'Analytics ID' appearance option on your customize page. Click the 'Share on Twitter' button and follow the steps to authorize the app. Now you will be able to see tweets on your blog, each theme has options to determine display and quantity of tweets. Please note this is for advanced users only who are comfortable with CSS. Custom CSS can be added by navigating to the advanced options at the bottom of the customize page sidebar. All themes use BEM syntax for css, so selectors like '.post--video .post__content' will target the content of video posts. You can use web inspectors to find elements and appropriate selectors. There are 2 types of licences available for premium themes. Personal licences are for private individuals for use on up to 4 blogs, commercial licences are for businesses and profit-making entities and are for use on up to 20 blogs. Additionally, commercially-licensed themes don't include a theme credit icon (present in the top right corner on free and personally-licensed themes). We have a tracking system which stops theme purchases being abused and mass distribution, if your theme code is recorded as being used on more blogs than it's licenced for we have a right to remotely remove its advanced features. If you're unhappy with your theme purchase for whatever reason we will fully refund it within 30 days. After that we may be able to refund it depending on your reason, please email us. Obviously, if you are refunded you can no longer use the theme. This information is only applicable for Generation 3 themes (Celestina, Broderick, Cygnus and Elphinstone). You no longer have to register your username, yippee! If you change your tumblr username and want to change your username you can go here to take your theme with you.